Welcome to the haunted hovels section of Haunted places in Nevada. Please select a link below to view information on that location. This hotel is reportedly haunted by a ghost called 'Tommy'. He is either a former owner or employee. Apparently, Tommy has been seen or felt at the end of the bar, and people have heard clunking around upstairs in the old, closed, hotel. The diner is said to be haunted by 'the lady in blue', who was killed by a drunk.The lady in blue has been known to follow women into the bathroom. Witnesses say that while they were looking in the mirror her face slowly replaced theirs then it suddenly disappeared. She also swings the light fixtures back and forth and turns the lights off in the toilets. There are several places in this base that hold claim to being haunted. In barracks 3, on the third deck strange sounds come from the room where a suicide occurred, and the lounge TV turns on by itself. Another is Tahoe House, when there's no current occupants the strong smell of a floral scent can be experienced and the second deck room occupied by a pilot who was killed during an exercise flight is claimed, by some members of staff, to haunt the room. This house is reported to be haunted by many spirits. It is now an antique shop. It was once home to the local undertaker. Afterwards, it became a family home. The Dake house is very old, the most common spirit to be seen is that of an old woman. Staff report seeing an old woman in a housecoat walking around after everything has been locked up. Some people also report being slapped or pushed. Several of the rooms and guest houses here are said to be haunted. The owner of the hotel says she, personally, has never experienced anything but many of the guests and employees have smelled unexplained smoke and alcohol, and they have heard alarm clocks buzz every hour, even when they have been unplugged. On the seventh floor in the Panorama suite, visitors report hearing a key in the door and quiet whispering coming from the foyer for quite some time, they also say that they could feel a presence. The door buzzer rang a couple of times but no one was there and items started appearing from nowhere. Formerly the Dunes Hotel and Casino in 1993, before the closing of the hotel, there were several reports of feeling cold spots throughout the resorts main tower and casino. Also after hours in the lounge on the top floor of the hotel witnesses say they could see a blue glow and hear the voices of people even though no one was there. The hotel was demolished on October 23rd 1993, and has now been replaced by the Bellagio. One of the cocktail waitresses on the night shift at Caesars reports that in the bathrooms down the escalator in the Forum Casino, the automatic water taps turn on and off of their own accord. She said that if you were to put your hands under one of the already running taps it would turn off. She saw the taps turn on and off many times with her being the only one in the room. Witnesses have heard loud cries for help in the poker rooms and also in rooms 123, 230, 576 and 203 in the bathroom at night there has also been heard the words 'help me' and someone screaming bloody murder that they want help also a 76 year old man, that had worked there for twenty years, claims that three people were killed in the kitchen on the same night and the woman that resides in room 123 shot her young boy before turining the gun on herself, and ever since then the young boy and his mother haunt the place looking for there father and husband respectively, and anyone with same name as Robert who is unfortunate to also have black hair supposedly gets murdered and hung from the ceiling. There have been many sightings of an old man walking the halls of this school reported by new students coming from another state. They always see the same thing, a man dressed as a care taker, walking around in the hallway with blood on his hands. When the school holidays come around, the man is said to follow them all the way home then disappear. The student is said to, understandably, have nightmares and see this man in their dreams. This has only happened to new students enrolling to the school. There have been many reports of fourth grade teachers, and students that have seen a girl dressed in white that follows the students around the school. They say that only the teachers and fourth graders can see her. This girl appears out of nowhere and is often seen in room 26 and in the computer room. Stories say that this girl was a former student at Edwards. She enrolled in the school in 1990 and died during her fist year at the school, she was in the fourth grade and that's why only the children that are currently in this grade can see her. Some of the children claim that when they saw her face, it was deformed and she would screech really loud and would appear in the child's dream at night. Is is common belief that this Las Vegas landmark is haunted by its founding father, the infamous mobster Bugsy Segal. Guests lounging by the pool in the late evening hours when the pool is less crowded have seen the apparition of him. And a cleaner quit her job after she saw Bugsy on the fifth floor. The second floor of these offices are said to be haunted by a ghost from a former surgical suite. Apparently, a man died during a procedure and has been known to stomp after the sun goes down, why he does this is unclear. There has also been evidence of an unknown dark coloured liquid seeping down the walls into the first floor. The daycare center was closed because there was supposedly a teacher who committed suicide and also a little boy who was killed getting dragged underneath the tracks of the toy train. Some people say usually at night or on occasion in the day there is a presence of a little boy digging with his shovel in the ground. Nobody knows who he is, but sometimes he appears out of nowhere and some said at night a black woman can been seen trespassing before disappearing into thin air. Reports say that the toilets by the 'Danny Gans' theatre are haunted. The automatic taps go on by themselves when in there late and alone. One cleaning lady refuses to go in there and she holds her rosary beads as she passes the area after she witnessed the sinks while cleaning in there. There are rumors that a wall fell down on workers while the casino was being built. If you turn off Charleston Boulevard onto Sandhill Road heading toward Sahara you will shortly pass a set of flood control tunnels that pass under the freeway and let out onto a small neighborhood street named Olive. Many neighborhood residents use this as and uncomfortable but fast shortcut to the other side of the freeway and the neighborhood children often play in them. Many people have reported hearing the voices of two people whispering in the tunnels late in the evening when there is no-one around. They sound like a male and female and the story says that just before those tunnels were built a young couple were flying down Olive on motorcycles and hit the pile of construction debris that were there at the time. They crashed in the early hours of morning and were not discovered until around 6 am. Visitors to this hotel are greeted at the entrance by a large tiki mask, and over the years many people have reported getting a terrible purple rash after touching it. And when people have taken pictures in front of it they report seeing a strange purple hazy cloud of smoke in the picture after they have had the pictures developed. Legend tells us that when Indians died they would bury their loved ones under their homes. More recently while houses were being built near the School they have found corpses while laying the foundations. While at the School on a quiet night with few people a dark shadowy figure often is said to appear. It has a tendency to follow people around, even through fences, and then suddenly disappear. This hotel is reportedly haunted by several apparitions who appear on second floor hallway and bathroom. The hotel is renowned locally as a haven for supernatural occurrences, and many people have seen strange thing while staying there. There was a woman murdered in the hotel and she still haunts it to this day. There have been two separate instances with two witnesses, they report hearing someone in great physical distress in the first stall of the woman’s toilets in the Mitzpah Hotel Restaurant. Concerned and a slightly embarrassed, because they could hear the woman sighing and groaning for several minutes. They finally decided to ask if she was alright, and as they were washing their hands and deciding what to say, they noticed that the stall door was open and they were alone. It is a very small area, and is isolated and removed from the main casino area. Charles M. Keller, the head teacher from January 1985 until June 1992, learned of strange happenings when he arrived for work, there would be lights going off for no reason during the day and strange things happening at night. Teachers working late at night would have feelings that someone was watching them, they also heard strange rapping sounds, and one teacher saw an apparition of a man. Mr. Keller wrote a ghost story called, 'Jake, The Ghost', as a Halloween story for the children, teachers, and staff in 1985. The story resulted in more reports of strange behavior from the staff. One of the teachers working late one evening heard scuffing footsteps coming down the hall toward her classroom. When she investigated she saw nothing but the steps were still coming towards her. She was so frightened by this that she climbed out of the window, ran across the street to one of the neighboring houses and called her husband for help. It was not until about 2006 when the identity of the ghost was discovered. In September 1903 there was a Chinese race riot. The local labor union for some reason decided they wanted to run all the Chinese people out of town. During the riot a Chinese man, by the name of Ping Ling, was badly beaten and hit over the right eye with a hatchet. He decided to walk out of town and leave the area. He bled to death on the road. That road now is the same one that is between Silver Rim School and the Mormon LDS Church. Silver Rim School was not built until 1980. Where the ghost of Ping Ling was until that time is uncertain. Why he chose to take up residence of the school is another mystery. Mr. Keller is certain Ping Ling means no harm to the people in the building. He is not seen or heard during the day when there are activities in the school. But at night he is quite active and curious. However, Mr. Keller made many trips back to the school at night, especially during the winter, to check security and the heating system. He never encountered Ping Ling on any of his trips. He could only surmise Ping Ling respected him. It is said that 'Two Feathers', who was possibly an Indian Chief, was killed after a fight in the saloon. 'Two Feathers' controls one nickel slot machine. On the second or third floor, there is a doll, and if you change her clothes, they will be changed back to original dress she was wearing. It is said that a little girl was run over by a wagon, and also her mother can be heard crying over the loss of her little girl. Many people have seen 'blue lights' at night, along with other strange phenomena. 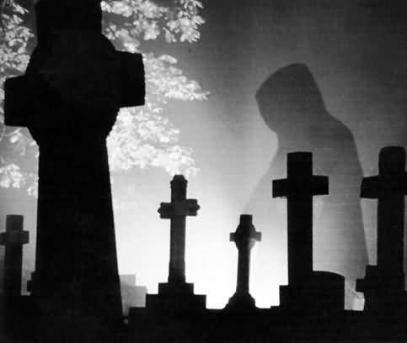 There have been reports from visitors to the cemetery after dark, of a certain gravestone that seems to emit a strange light that can be seen from far away. When the people try to find it, the light gradually disappears. There is also a man's gravestone that moves from his gravesite frequently, although security reports that no one has entered the cemetery, and it is also a large piece of stone, too big for a single person to move, and it requires three people at least to move it back. Mrs. Bower's, who died penniless after the death of her husband, is said to haunt the second floor of the house. She used to conduct Séances in the parlor after her husband died, in an attempt to contact him. The Graveyard on the hillside behind the Mansion has also been a spot of numerous sightings of glowing figures on moonless nights.